WEF, non-timber forest resource has been exploited across the globe since ancient period. Wide ranges of edible varieties, truffles, morels, termite mushrooms, milky caps, chanterelles, boletes etc. were part of cuisine in developed and developing counties. 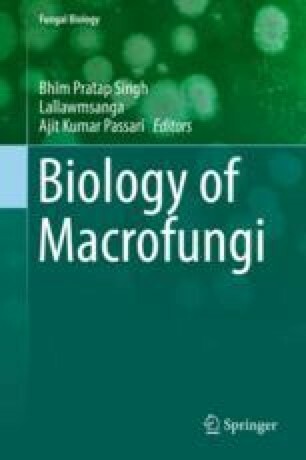 Considering the huge diversity of macrofungi, ca. 2,000 species of mushrooms has been documented so far but very few are commercially cultivated and marketed in different parts of the world. There is significant increase in edible mushrooms cultivation among developed countries. They are the source of cholesterol-free, low in calories, rich in proteins, carbohydrates, vitamins, minerals, fibres, many secondary metabolites including VOCs. These biomolecules have beneficial effects on humankind for treating many health disorders. In view of growing population and many health problems, the available known edible wild and cultivated mushrooms is yet deficient. There are numerous potential edible mushrooms with nutraceutical and health benefits, which deserve further investigations. Adapting new cultivation strategies for ectomycorrhizal edible fungi will have great impact on local businesses. Because they help in sustaining the natural forest and can promote commercial plantation in tropical zones. Moreover, it may increase the additional income to the small scale business enterprises in many developing countries. Pauli G (1998) Qingyuan: the mushroom capital of the world (available at www.zeri.org/ news/1998/august/aug_chin.htm).